I share a passion with several friends about custom and vintage cars. 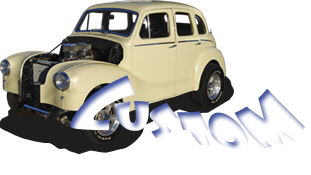 I appreciate, and try to project the quality, craftsmanship and passion car owner / builders put into their custom cars. I have been an digital design artistfor over 30 years. I hope to combine my career in graphic design with digital photography, computer graphics, typesetting and digital printing to capture your custom hot rod in art. have helped me through this endeavour. Especially my family and friends... you know who you are!